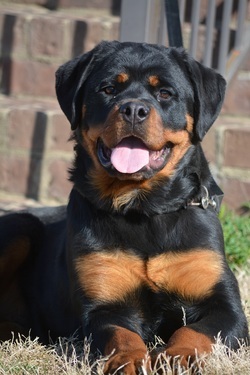 Welcome to Von Brantley Rottweilers - ﻿﻿﻿﻿We are a family hobby breeder that absolutely loves this breed, and put a lot of time and research into the selection of our dogs, to ensure that we continue the hard work of long time breeders. This ensures that we get the best puppy possible. With years of careful selection and breeding experience, we use only the best of temperament in our breeding program.We are dedicated to preserving the breed! We focus on producing the "complete Rottweiler" who is able to work, show, and companionship. All of our Rottweilers are raised in the home with the family and socialized with members of the family and friends. I started breeding because I absolutely love and respect the Rottweiler, to me there is no other breed! I love this magnificent dog for its ability, intelligence, affection, and most important of all, loyalty. Rottweilers began to be used in police work, for which they were well suited. Several Rottweiler breed clubs were formed over the years, but the one with staying power was the Allgemeiner Deutscher Rottweiler Klub (ADRK), founded in 1921. The ADRK survived World War II and has continued to promote good breeding programs in Germany and throughout the world. It's dedicated to preserving the working ability of the Rottweiler. It's thought that the first Rottweiler came to the U.S. with a German emigrant in the late 1920s. The first litter was whelped in 1930, and the first dog registered by the American Kennel Club was Stina v Felsenmeer in 1931. After World War II, the breed started becoming more popular. At that time, it was primarily known as an excellent obedience dog. The height of the Rottweiler's popularity was in the mid-1990s when more than 100,000 were registered with the American Kennel Club. Being popular isn't necessarily a good thing when you're a dog. It's not unusual for irresponsible breeders and puppy mills to try to cash in on the popularity of a breed and start producing puppies without regard for health and temperament problems. This is what happened to the Rottweiler breed until bad publicity and the demand for them decreased. 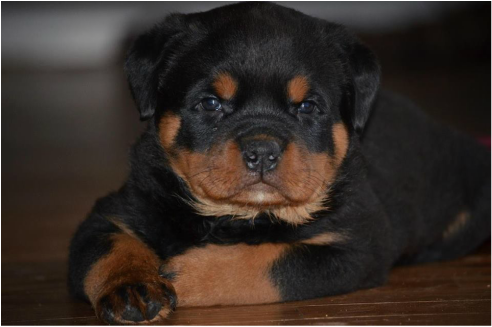 Dedicated, reputable breeders are taking this chance to turn the breed around and ensure that Rottweilers are the type of dogs they were meant to be. Today, Rottweilers rank 17th among the 155 breeds and varieties registered by the AKC.